When Jesus saw the great multitudes about him, he gave instructions to travel to the other side. A scribe approached him and said, "Teacher, I will follow you wherever you go." And Jesus said to him, "The foxes have holes, and the birds of the heaven have nests; but the Son of man has nowhere to lay his head." Another of the disciples said to him, "Lord, let me go bury my father first." But Jesus said, "Follow me; and leave the dead to bury their own dead." He boarded a boat, his disciples following him; and there arose a great storm in the sea, powerful enough that the boat was covered with waves; but he was asleep. So they awoke him, saying, "Save us, Lord; we are perishing." And he said, "Why are you fearful, O ye of little faith?" Then he arose and rebuked the winds and the sea; and there was a great calm. And the men marvelled, saying, "What manner of man is this, that even the winds and the sea obey him?" The accounts of Jesus' travels after his baptism are different in each of the gospels, and are difficult to reconcile in a few instances. Shifting borders, names, and political structures make for many difficulties. At the time covered by this passage, there were three areas in which most events occur, lying between Mediterranean Sea and the Jordan River, stacked on top of each other like bricks. The northernmost, Galilee, was Christ's home province, where Nazareth was located, and included the west bank of the Sea of Galilee (called 'Lake Tiberius' by the Romans). South of Galilee was Samaria, and then Judea, the district of Jerusalem and Bethlehem. In his early ministry, Christ made Capernum (the home of Simon Peter) on the northwest shore of the Sea of Galilee his home base; the people there were receptive to his teachings, unlike those of his home town of Nazareth. 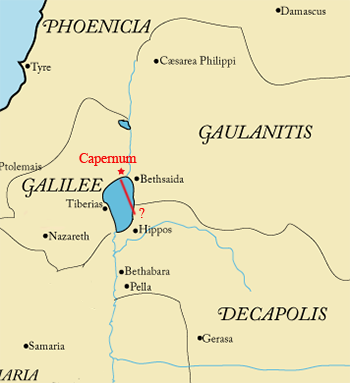 The site of Capernum is accurately known. The site of Christ's baptism is much debated, however; John calls the location "Bethany across the Jordan". The traditional site places this on the west bank of the Jordan a few miles north of the Dead Sea, but modern archaeology, as well as the name, gives evidence in favor of a spring-fed tributary east of the Jordan. In today's passage, Christ crosses the sea from Capernum to the southeast. He landed somewhere in the poorly delineated northern and eastern frontier of the Roman Empire called "The Decapolis" (Greek for "the ten cities"). This would have been something of a foreign country for Aramaic-speaking Hebrews from Galilee. As in Galilee, the roots of the ten cities were Semitic, but the land east of the Jordan had been heavily colonized and accultured to Greek civilization by Alexander the Great. At the time of Christ, the majority of people would have been "Greek", at least in culture and often in ancestry. In some ways, the voyage was similar to a French speaking group visiting Montreal. The large herd of swine we are soon to encounter, for example, would have been rare or nonexistent west of the Jordan, as pork was unclean to Hebrews and some other Semitic groups. The place of the landing is not known. The next place mentioned in Matthew is the "land of the Gadarenes", which is described but still difficult to locate today. The best estimate is the area between the semi-autonomous city of Gadara (in present day Jordan) and the Sea of Galilee, which has a good slope to the sea which swine might tumble down.